How much more of the “booking cake” can the OTAs (Online Travel Agents) take and how much bigger is the online booking sphere getting? They’re both interesting questions we continue to ask ourselves with a view to helping independent properties generate more direct bookings and reduce commission bills. There is now evidence that the growth in new online customers is starting to flatten and mature. The OTAs are giant corporations that require continual growth to fire their share price. With fewer new online customers to sell to, the OTAs are looking for ways to keep their growth on target and some have been launching products to control your direct bookings. This strategy of getting income from your direct bookings doesn’t require them to find any new customers yet helps them expand their income. When they manage your direct bookings you are effectively providing them with an opportunity to acquire new customers, your direct customers. We have also seen some OTAs removing the customer’s direct email address when the booking has originated on their site. In the past they shared these details freely with the property owners but now you need to make the effort to obtain the customer’s contact details. This will lead to less communication between you and the customer, reducing your ability to make direct marketing offers and run loyalty promotions. The knock-on effect is to shift more bookings into commissionable income and reduce direct bookings. Make sure you get contact details of all your guests. How do the OTAs control so much of the online business? Well, they spend billions on online marketing to get customers to book on their website. Along with the expensive adverts they quite often advertise on the search engines under cheaper terms like your property name. When they advertise under your name customers looking for your property will see them first at the top of the Google page. You will also probably see them paying for advertising on other high traffic websites e.g. your TripAdvisor page. So what can you do about it ? Take your direct bookings very seriously, be under no illusions that you are in competition for your own direct bookings. You need to stop thinking that the property down the road is your main competition. In the online world your biggest competitor is most likely to be the OTA that provides you with the most bookings. If a potential customer has a better website experience on an OTA’s website then that’s where they’ll book. Make sure you have invested in a great website, lots of fantastic images (critical), a great design and good original copy. There is nothing new there but independent businesses are all too often reticent to invest in their marketing, seeing it purely as a cost. Have you ever wondered why the OTAs insist on you uploading so many great images? They know customers are more likely to book with them if they have great images of your property. A fantastic image led website will generate more direct bookings and save commission. Making sure your website is the best it can be will give you an edge when competing for direct bookings. Some of the big hotel chains even keep their best images for their own website so that they have better visual content for direct customers. It’s a fact that big OTAs have a global sales coverage that independent accommodation owners can’t match. Learn from the way the big hotel chains do it, they use the OTAs for customer acquisition in areas they cannot reach. Use the OTAs to get the bookings in and convert the customers to future loyal direct bookers. Not all OTAs are the same, some customers have loyalty to a specific OTA that they use most of the time. If you rely on just one OTA for too large a percentage of your bookings then you should probably diversify the source of your OTA business. Work with the biggest OTAs but not just one of them. This gives you more online exposure, access to more customers, reduces your reliance on a specific channel and gives you a better mix of customers. It’s also a lot easier to bargain with the OTAs if you have more than one. Co-operation between nearby properties will help grow direct bookings for all. When it comes to getting more direct bookings your main competitor is your OTA. If properties switched from competing with each other to cooperating there would be a mutual benefit for all. Taking it to another level some accommodation owners have enjoyed significant success by cooperating and creating bookable websites featuring their members, examples include Fort William and St Ives in the UK (see freetobook together). 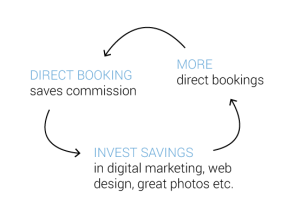 The benefits of more direct bookings are clear, the simplest calculation is the commission. By cutting out the middleman you save precious commission but importantly you also own the customer relationship. You have the customer’s contact details, and from the booking onwards it’s your brand that they will communicate with, not the OTAs. The direct booking message is simple so make it clear on your website, social media, emails, brochures and do let guests know that booking direct is better for them and better for you. The service you offer from the point of confirmation to their stay with you and beyond is all yours. With direct bookings you have no communications middleman, so take advantage of the opportunity to differentiate yourself and be “special”. Always have the best rate on your website. If you ever feel the need to make a special offer make sure it’s on your website so customers booking direct never pay more. It can be complex in the online world, as an independent family business we try to keep things simple and in perspective for smaller businesses, there’s lots of bookings out there you just have to keep chasing them. Hi Mike, that is a very broad question. I think the best place to start would be our blog which covers lots of marketing tips and outlines many of the services you can use to boost your bookings. Hi can you give me a price please. Currently u an with Supercontrol. I may change. Reading your article, I appear to be very fortunate as I finished with the 3 OTA’s that I signed up with through Free To Book and get all my bookings direct, having a good Google ranking so that’s the way to avoid OTA’s. Regarding the contact details for guests, in particular their email address, I have mentioned, or asked yourselves before, if their was a way of contacting all, or those that I would like to, by email through FTB. Through this special offers with promo codes could be made to encourage them to return. Offers could be ‘gift vouchers’ for family members, discounts or free days and if the guests first names could be entered into the message making it more personal, I think it would be a great help in getting guests to return..
That is great news Chris regarding the shedding of OTAs. You can export your customers details to a csv/excel file to email them from another email client. You do this in tab “Diary” and “Reports” on the orange bar. Bulk emailing is a specialist function and there are many companies that offer a free version for low volume email sending. Take a look at MailChimp its free upto 2000 email addresses, I hope it suits your needs. I thought that we could not advertise a cheaper rate on our own website than what the OTA have! thought that we could not have a lower price on own website to what the OTA have !! If I link with trip advisor does that mean I have to pay trip advisor for all direct bookings to my website? No your website bookings are always free from any charges, the TripAdvisor charges only apply to bookings made on their website. You would only pay for the ones that book on TripAdvisor’s own website, with Instant Booking the customer will book on TripAdvsior’s website not yours. All bookings on your own website are commission free !